Remington Spartan 310 shotgun: Russian-made Baikal shotguns have always enjoyed a wide fan base in this country, particularly among rough shooters who want a tough, reliable, no-frills over-under at a low price. The guns might be basic, but they are honestly made and give loyal service. When Remington decided it wanted to market a budget price range of rugged guns it turned to Baikal to come up with the goods. Remington, of course, is a huge name in American gunmaking circles, so it might seem a little strange that it should turn to a Russian gun house for an over-under to carry its banner. Say hello, then, to the Spartan – a model made in 12, 16, 20, 28-bore and .410 gauge, most of which are available in this country thanks to Remington distributors, Edgar Brothers Ltd. 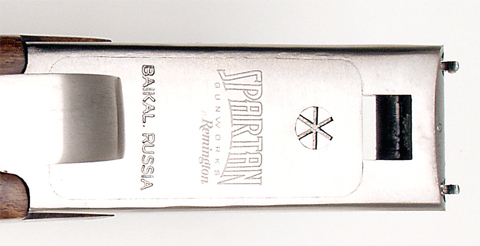 The Spartan follows the basic mechanical principles of previous Baikals by sporting a front cross pin for the barrels to hinge on and a full width bolt in the floor of the action frame that engages with a bite in the barrel lumps. 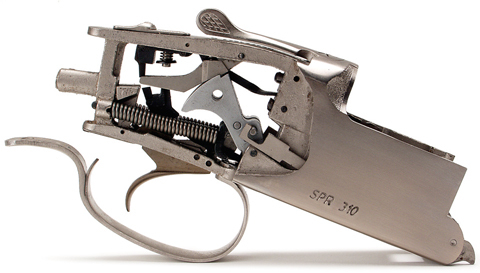 The Remington Baikal features a simple, effective, trigger mechanism, built on traditional lines. The action frame is finished nickel silver which is durable for rough use, but also looks good. Barrels are built to a monoblock construction with a narrow 6mm ventilated top rib and solid side ribs. The top rib has been slightly raised to improve pointability and the bores have been chrome lined for maximum durability. The gun on show here is a 20-bore that features 3in (76mm) chambers and comes supplied with four multichokes. This one has 28in barrels but a 26in version is also available, making it a handy little contender for a youngster just starting out in shooting. The mechanics on this gun are simple with the hammers pivoting at the bottom of the action frame with the sear suspended from above. Coil springs power the hammers forward and there is a default setting that ensures the gun will always fire bottom barrel first. You can override this when the gun is loaded, and closed, by pushing the single trigger forward until you feel, or hear, a click from the mechanism. The gun is now ready to fire, top barrel first, but will restore to bottom barrel as soon as you open the gun again. The gun automatically returns to safe when the gun is opened as well. The woodwork is very basic and is Baikal’s own style. The finish is fairly rough, but still meets the purpose intended of it. The stock’s length of pull is 14.1/2in and drops at comb and heel are 1.1/2in and 2.1/4in respectively. There’s also a slight right hand cast and a black recoil pad is fitted to the stock. Overall weight is approximately 7.1/2lb. Remember the old jokes about Skoda cars? Baikal guns used to fit in the same category but, while they were a bit rough and ready, in the end they had the last laugh. They proved very reliable. I’ve got no doubt that the Remington Spartan will do well in its intended market. More information available from Edgar Brothers Ltd, Macclesfield.